The 2012 ACT Planning Strategy sought to create a more compact, efficient and inclusive city that is renowned for its liveability. Since then, major changes have taken place to accommodate the growing city; the first stage of our light rail network is being constructed, urban renewal is transforming parts of our city and we have committed to a carbon neutral future. These changes, along with other drivers, provide an even stronger opportunity to achieve a compact and efficient city. Canberra's continued development as a compact and efficient city will provide increased diversity in where and how people live, while making the best use of existing land, infrastructure and assets to provide for a high quality of living. This approach to the future development of our city will improve accessibility and the connections between the spaces we use to live, work, study, shop and access services. Forecasts indicate that around 100,000 new homes would need to be constructed between 2018 and 2041 to meet projected housing demand. Their location is an important factor in assessing our urban growth, as is the impact that different densities and typologies have on our urban footprint. The higher the density, the less land is used; and the more efficient we can be in our use of our land. Map 3 displays the area of land taken by 50,000 dwellings at different densities. Urban growth should be located to best meet the needs of current and future Canberrans while upholding the qualities of the city we value such as our green spaces and unique neighbourhoods. Continued urban expansion puts pressure on the valued natural resources that surround the city such as our bushland and grasslands, landscape setting and connectivity of ecosystems. It creates demand for additional physical and social infrastructure such as roads, utilities and education and health services. Between 1991 and 2016 the ACT's urban land take grew by 57.3%1, whereas the population grew by 43.3%. This indicates we consumed significantly more land for urban development in comparison to our population growth. Our current urban footprint (as at 2016) is 372.6km2, with a population density of approximately 1062 residents/km2. The projected population at 2041 is 589,000. If current density continues unchanged, the urban footprint required to accommodate 589,000 residents at 2041 will be about 544km2, a 46% increase from 372.6km2. This growth pattern would not support a compact and efficient city. It would increase our travel times and decrease transport options, increase our ecological footprint and infrastructure servicing costs and would not support equitable access to services. However, if urban intensification continues the trends observed from 2011 to 2016, 589,000 residents could be accommodated within a 429km2 footprint, which equates to a 15.2% increase from 2016. While the social, economic and environmental implications of growth are paramount, continuing to provide for choice and diversity in where and how people live means considering all opportunities for growth. Urban intensification areas - the city centre, town and group centres and transit corridors which are areas of high accessibility. Areas within the existing residential footprint - blocks or sites in appropriate locations with the capacity to accommodate increased housing supply, density and choice; for example, large blocks in accessible locations with the potential for dual occupancy development. This could apply to the RZ1 Residential zone under the Territory Plan. Areas close to local centres (400 metres /average 5 minute walk) - areas that could be suited to medium density housing typologies. This could apply to the RZ2 Residential zone under the Territory Plan. Subject to a full assessment of environmental, transport, infrastructure and planning issues, the potential further expansion of the city into areas that are next to, or close to existing urban areas, and they must be areas that facilitate the efficient use of existing infrastructure and transport (or infrastructure that could be relatively easily and cost effectively extended). Maintaining a supply of greenfield housing in a variety of locations and price points contributes to the attractiveness of the ACT as a place to live. However, any further expansion of the city must be balanced against the need to protect key environmental values, and be in locations that facilitate accessibility to existing employment, services and infrastructure. Both options involve change, and there is a close interrelationship between the two; for example, greater infill opportunities may reduce the need to develop rural land on the periphery of the city. Map 6 shows potential urban growth areas, including infill and areas that may be suitable for urban expansion, subject to detailed investigation.This details the policy direction; implementation at the district or suburb level will be delivered over many years and be subject to ongoing consultation with residents and the community. Map 6: Growth Map. Click to view larger version. Support sustainable urban growth by working towards delivering up to 70% of new housing within our existing urban footprint, and by concentrating development in areas located close to the city centre, town and group centres and along key transit corridors. Sustainable growth of our city must support high levels of transport accessibility and the efficient use of existing physical and social infrastructure. It must be capable of providing a range of lifestyle choices. A key strategic direction of the 2012 strategy was urban intensification around key town and group centres and along major public transport routes. This policy has been supported through the delivery of master plans for priority areas (such as Belconnen, Tuggeranong and Woden town centres) and key public transport corridors (such as the City and Gateway). While the 2012 strategy required the proportion of new housing to be delivered through urban intensification to be 50% or more, an average of 63% of all new housing has been achieved through infill development between the financial years 2011-12 and 2016-17, demonstrating the success of the policy in achieving urban intensification outcomes. Figure 5 demonstrates the rates of infill development compared to greenfield between 2011 and 2017. This 2018 Strategy seeks to build upon and enhance the direction established in the 2012 strategy. It establishes that the majority of urban growth will occur within our existing urban footprint, building upon our structure of districts and centres connected by inter-town public transport corridors. Because of the success of the 2012 strategy, and in order to respond to new opportunities that have since arisen (for example, the development of light rail) this 2018 Strategy seeks to deliver up to 70% of new housing as infill development. Working towards a higher rate of infill development aligns with other key social, environmental and economic imperatives facing the ACT, including a carbon neutral future, and demographic trends favouring greater housing choice. Higher density development will be strategically concentrated in defined areas of the city, including centres and public transport corridors. The renewal of our city, town and group centres also provides opportunities for greater lifestyle choice, while increasing the vibrancy and economic viability of centres. Investigation of the opportunities for urban intensification along our key inter-town public transport corridors where there is investment in mass transit, both existing and proposed, will promote the future sustainable growth of our city and improve the accessibility and viability of public transport. A key example of the potential for growth along a transport corridor is the urban intensification occurring along the Northbourne Avenue light rail corridor. This growth will be guided by the City and Gateway Urban Design Framework (the Framework) jointly prepared by the National Capital Authority and ACT Government. Opportunities for infill development will be considered by location, neighbourhood characteristics and the capacity of existing and proposed infrastructure. Infill around key transport routes and centres could provide opportunities for walking and cycling, promoting a healthy lifestyle and contributing to liveability. Accessibility to public open space and the future capacity of social and civil infrastructure will be assessed in identified urban intensification locations.Our current urban structure of districts provides a sound base on which to deliver this direction. This direction will build on the strengths, opportunities and character of each district to achieve place-based outcomes. Map 7: Planned light rail network. Click to view larger version. 1.1.3 Undertake preliminary land use investigations for the potential City to Woden light rail line to determine the opportunities for urban intensification afforded by increased transport accessibility. easy access to nearby open space. Investigate the potential for new residential areas to the west of the city to meet future housing need. Population growth brings demand for new residential development locations. 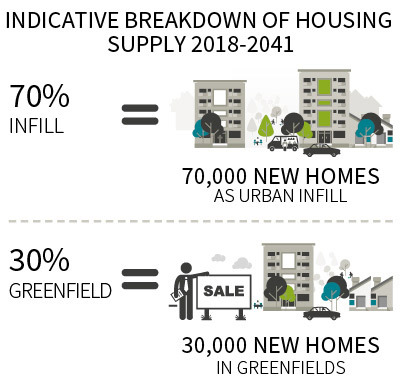 Many new housing areas on the edge of the city (known as 'greenfield' areas) identified in the 2012 strategy have now been developed, or are forecast to be completed in the short to medium term (2018 to 2031). So we can provide diversity in where and how people live, this 2018 Strategy considers long-term growth, including potential future greenfield areas required between 2031 and 2045. The process of investigating the suitability of land for urban growth can take around 10 to 15 years. The 2012 strategy assumed an estimated supply of new greenfield land in Gungahlin and Molonglo Valley of 48,000 dwelling sites over the strategy's timeframe (2012 to 2031). However, actual supply was reduced to 36,887 (11,113 less than anticipated) due to a number of areas being removed from development to protect and retain their environmental values. Current estimates are that land supply in Gungahlin will be exhausted by 2021-22, with the exception of higher density units in the town centre, and in Molonglo by 2030-31. The NSW component of the Ginninderry development and possible redevelopment of the Commonwealth Scientific and Industrial Research Organisation (CSIRO) land in Belconnen may extend these timeframes. Future locations for greenfield housing need to be identified so that we can continue to provide housing choice. The options for urban expansion are limited. To the east of the city, the airport and environmentally significant areas preclude residential development. To the south, bushland and mountainous areas limit opportunities for expansion as, to the north, do the ACT/NSW border and nationally significant environmental areas. infrastructure-access to existing infrastructure, transport services and ease of augmentation (i.e. extension). Following this process, West Murrumbidgee, Western Greenway, Central Molonglo and other areas were removed from consideration for this 2018 Strategy due to the complexity of environmental, landscape and community values. The Kowen Plateau was discounted due to significant infrastructure and sustainability considerations associated with the distance from urban Canberra. These areas may be re-examined in future reviews of the ACT Planning Strategy. An area to the west of the city (beyond the Weston Creek and Molonglo districts) is a possible location for future urban expansion, subject to detailed investigation (see Map 6). This area appears to have few significant environmental and infrastructure constraints and is close to existing urban areas, providing good access to facilities, services and employment. The area was originally identified for further study in the 2012 strategy, and this 2018 Strategy has further refined the locational boundary. Investigations will begin to ascertain the values of the area and provide clarity about its future direction, including any role in urban expansion. Central Molonglo is not being considered for urban expansion as part of this Strategy. 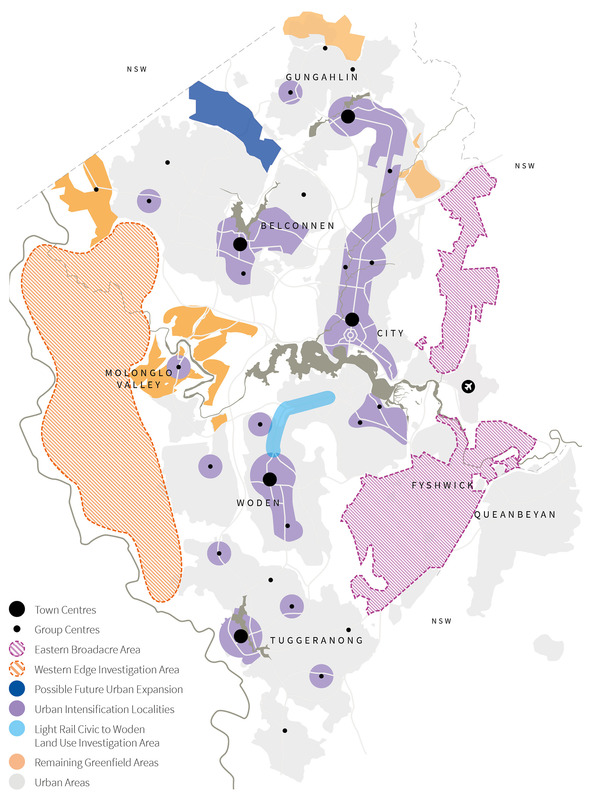 However, Central Molonglo is included in the western edge investigation area to enable it to be considered in the context of future investigations proposed for the entire western edge, and in order to ensure that the future use and management of Central Molonglo can be confirmed. other uses, for example rural, broadacre, major infrastructure, transport and services. The planning investigations referred to above must consider the appropriateness of the western area in the context of ACT-wide opportunities for urban (greenfield) growth. Use infrastructure efficiently to support our growing community. This Strategy considers the infrastructure demands of growth. Growth must be supported by essential infrastructure such as transport, drainage, water supply, wastewater collection and treatment, energy supplies and communication systems. To continue to provide these essential services, planning processes must consider where infrastructure augmentation is required and how to better utilise and build upon existing infrastructure. Better use of existing infrastructure is key to supporting population growth and investment in the right places, leading to a more compact and efficient urban form. Infrastructure for greenfield development is estimated to be many times more expensive than for infill development. Because infill development can use existing infrastructure it requires significantly less infrastructure investment per capita. 'future-proofing' new and existing infrastructure so it can support urban growth and be adaptable to changes in growth patterns and technological innovation. Infrastructure investigations will be undertaken under this Strategy (Direction 1.1) for significant infill and redevelopment areas within Canberra's existing urban footprint. These will help forecast infrastructure demands at different growth scenarios and identify potential stress points for existing infrastructure networks. Other infrastructure investigations will help determine the feasibility, suitability and priority of development along the western edge (Direction 1.2). The location and staging of future greenfield areas must represent a logical and cost-effective expansion of Canberra's urban area. The investigations will examine the infrastructure needs, options and costs of development including capital costs; whole-of-life costs and costs per dwelling; utilisation of existing infrastructure; interdependencies; and potential environmental implications. 1.3.1 Continue to align land use planning and infrastructure planning to support the growth of the city. Continue to work with the NSW Government and Councils to implement joint initiatives to understand and manage growth in the Canberra Region. The ACT adjoins some of the fastest growing areas in NSW, leading to growing relationships in terms of housing, transport, employment and services. These relationships make it essential that the region is considered in the long-term planning for the ACT. This direction is about working with the NSW Government and councils in the region to understand and appropriately manage regional growth. It recognises that we face similar issues and can improve our understanding of these issues by sharing information, monitoring trends and preparing collaborative responses. Collaborative planning between the ACT and NSW governments and councils in the region focusses on the Canberra Region (See Map 8), comprising the ACT and surrounding local government areas. In June 2016, the Canberra Region had an estimated total population of 627,5872, only slightly smaller than the significant population clusters of Gold Coast-Tweed and the Hunter Valley (including Newcastle) and twice as large as Geelong, Victoria's second largest city. The Canberra Region's population is almost three times the size of Greater Hobart3. Proximity to Canberra is generating growth in surrounding local government areas, with resulting pressures to convert rural areas close to Canberra to urban use. The population of the Canberra Region within an hour's commute of the ACT was 512,000 in 2016, and is projected to be more than 660,000 by 2033, an increase of almost 30%4. This has significant implications for decisions regarding land use and transport in the region. As a regional centre, Canberra provides employment and a range of higher-order services, entertainment and activities, and major tertiary education and health facilities for the surrounding region. Regional and cross-border travel associated with this role places pressure on the road network, which is already under congestion at key entry points and downstream at peak times. To sustain economic development in the Canberra Region, this road network must also perform efficiently for freight transport. In 2017 the NSW Government published the South East and Tablelands Regional Plan 2036, which provides a framework for managing growth and establishes policy directions to inform the work of the nine NSW local government areas surrounding the ACT. A key policy direction under the regional plan is that growth is directed to existing urban areas, towns and villages to make the best use of existing infrastructure and services and to support their growth. Although not applying to the ACT, the regional plan acknowledges the close relationships with the ACT and contains joint actions around planning, climate change, service provision, economic development, catchment management, heritage protection, natural resource management and waste management. The cross-border infrastructure funding model, and the cross-border land and housing monitor have commenced, while a strategic approach to water supply in the region is an ongoing action. The ACT Government will continue to work with the NSW Government in delivering these actions. The regional plan also addresses transport issues, including cross-border commuting to the ACT and freight transport planning. Of the 27,587 daily NSW commuters to the ACT in 2016, approximately 18,830 (68%) were from Queanbeyan, 4385 (16%) from the Young-Yass District, 972 (4%) from Goulburn and 3400 (12%) from other areas5. Strategic transport modelling suggests that by 2031, over 33,500 commuters will cross the border daily into the ACT from Queanbeyan alone6. 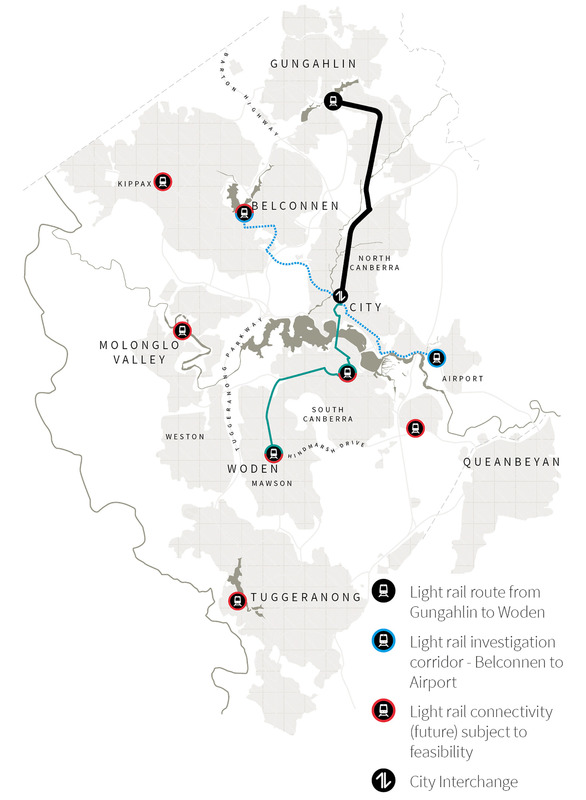 A major issue for the sustainability of Canberra and the surrounding region is that many of these commuters travel by private vehicle as seamless cross-border public transport is currently unavailable. ACT buses are not authorised to travel into NSW, and fares, services and timetables are inconsistent between the ACT and NSW. The new transport strategy will seek to progress further improvements to cross-border public transport including working with the NSW Government to achieve a rail journey time to Sydney of under three hours. This improvement could provide a commuter link to regional centres, and a viable business and tourist travel option. Sustained population growth, interdependent economic relationships and complex issues of service delivery require a coordinated approach to support the region's future. Regional collaboration occurs through a number of forums and mechanisms including the Canberra Region Joint Organisation (CRJO)7 and under the ACT-NSW Memorandum of Understanding for Regional Collaboration (2016) and ongoing Annual Work Plan. Additional collaboration occurs with Queanbeyan-Palerang Council through the Letter of Intent between the ACT Government and Queanbeyan-Palerang Regional Council (2016). 1.4.1 Progress joint ACT and NSW planning actions identified in the NSW Government's South East and Tablelands Regional Plan 2036 including an agreed set of principles to inform a new cross-border infrastructure funding model and a cross-border land and housing monitor. Protect the ACT and NSW border interface. The location and type of growth in the region, and particularly the areas that immediately adjoin the ACT, has a range of implications for the Canberra Region, and the achievement of a compact and efficient city under this Strategy. There has been increasing interest in the development of NSW rural areas located within commuting distance of Canberra. These areas are not next to existing urban areas or towns, and proposals for urban development raise a number of sustainability, infrastructure servicing and environmental concerns. Suitable buffers or separation are required between the expanding urban area of the ACT and adjoining areas of NSW. In some cases there is potential for land use conflict between urban uses in the ACT and the adjoining rural or reserve areas in NSW, or with industrial uses in the ACT and adjoining residential areas in NSW. To protect the border interface areas to the north of the ACT, Yass Valley Council has proposed the introduction of a five-kilometre buffer zone extending from the ACT border, within which urban development would be prohibited (except for existing approved development at Ginninderry). From the ACT perspective, a buffer zone would encourage growth in appropriate locations, protect the key setting and approaches to the National Capital, protect high value ecological areas and enable our physical and social infrastructure to be used efficiently and not placed under further pressure. To the south of the ACT, Queanbeyan-Palerang Council is progressing planning for the South Jerrabomberra residential release area, which adjoins the Hume industrial area. To avoid future potential land use and conflict between industrial and residential uses, an appropriate buffer will be required in the design of South Jerrabomberra. 1.5.1 Support the provision of adequate buffer areas between the urban areas of the ACT and adjoining land uses within NSW in order to achieve compact and efficient growth, avoid land use conflict, protect rural and environmentally important areas, and maintain the setting and approaches to the National Capital. 1. EPSDD. 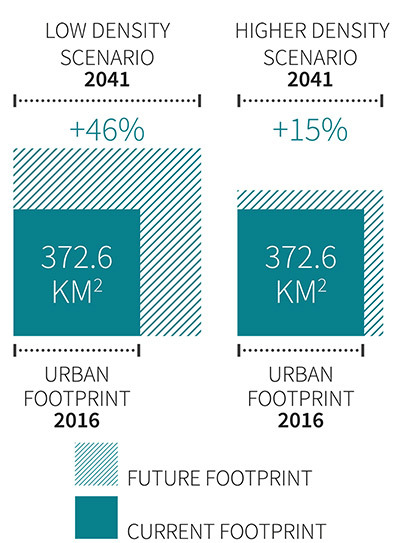 Calculated based on ABS urban centre and footprint data 1991-2016. City urban land area is a gross metric calculated from the contiguous perimeter edge of peripheral urban localities defined by ABS urban character criteria of demography and density. The figure includes all land within the contiguous perimeter regardless of land use. | Return to content. 2. Not including Wingecarribee which was not part of the grouping as at June 2016. | Return to content. 3. 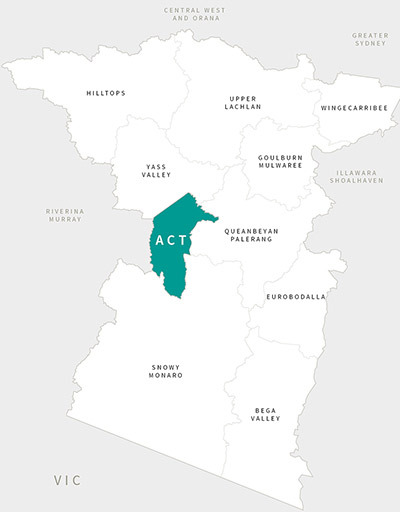 Canberra Region profile (February 2018), ACT Government. Chief Minister's, Treasury and Economic Development Directorate. | Return to content. 4. Including the Territory's population itself. Source: NSW Government 'South East and Tablelands Regional Plan 2036' (2017). | Return to content. 5. Journey to work figures based on the 2016 ABS Census. ACT Government, Transport Canberra and City Services Directorate, 4 September 2018. | Return to content. 6. Canberra Strategic Transport Model, 2018, 4 September 2018 (Transport Canberra and City Services Directorate). | Return to content. 7. Members: Bega Valley, Eurobodalla, Goulburn Mulwaree, Hilltops, Queanbeyan-Palerang, Snowy Monaro, Upper Lachlan, Yass Valley, Wingecarribee and the ACT Government. | Return to content.